Birthday party guests may feel uncomfortable in a room full of people they don't know. 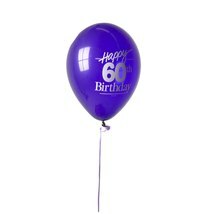 A birthday party for someone turning 60 may have a diverse guest list, including family and friends from the guest of honor's 60 years of life. With the guest of honor busy mingling and entertaining the guests, he can't focus too much time or attention on individual party goers. Hosts of a 60th birthday party can ease tension by encouraging guests to get to know each other through ice breaker games. Ice breaker party games lighten the mood and encourage guests at a birthday party to open up to each other. Playing trivia games about the guest of honor at a birthday party celebrates his life while challenging the party goers' knowledge of him. After 60 years, the birthday boy will have plenty of life experience that can be used to create a list of trivia questions. Party planners can distribute worksheets with the trivia questions or call out questions and wait for guests to provide answers. Ask questions about first job, hometown, favorite food, biggest fear and first car to find the guest with the most intimate knowledge of the guest of honor. When someone turns 60, friends and family members gather to celebrate this milestone and get a glimpse into her past. As a way to break the ice at a party, create a trivia game based on life as it was 60 years ago. This nostalgic quiz will provide a mini history lesson with questions about politics, pop culture, cars and economy. After guests fill in answers to the quizzes, the birthday guest of honor will attempt to provide the correct answers from memory. The guest list at a 60th birthday party includes family, friends and co-workers from a long span of life. Guests can all get to know each other by learning about their connections to the guest of honor. Guests at a party can create a short scenario, loosely based on the truth about meeting the birthday boy and write it under the name on their name tag. These nonsensical ideas will amuse party goers and prompt conversations between guests. They can also nominate a game champion who creates the most entertaining anecdote. Guests can get acquainted by playing a guessing game based on fun facts about each other. All guests should write down an unknown fact about themselves and put it in a box. The master of ceremonies will randomly read the fact cards and ask guests to guess who wrote them. At a dinner party, guests at a table can get to know each other by filling out index cards with four truths and one myth about themselves. People at the table should all try to pinpoint the false information on each card.